The White-Lipped Pit Viper is a poisonous snake which lives in the south Asian countries from India to south China. In Southeast Asia it is endemic in all the countries as Burma, Thailand, Laos, Cambodia, Vietnam, the Malay Peninsula and in Indonesia on the islands of Sumatra, Java, Borneo and others. It reaches a maximal size of not much more than 100cm. The White-Lipped Pit Viper is a nocturnal viper which poison is strong, but not often lethal for humans. Nevertheless, a bite means a serious injury and can cause not only strong pain, but a number of hefty effects. In bad cases large necroses can appear, means that a whole arm or leg will die off and need amputation. When coming close to humans the snake bites quickly, and accidents with humans happen frequently. For the venom of the White-Lipped Pit Viper exists an antiserum. The natural habitate of these viper is the forest and open grassland. It is known for intruding urban areas as well. When it arouses it means aggressivity and an attack is probable. It's less aggressive at daytime than at night. The mating season is September and October. A female can have up to sixteen offspring who have from young age on the same colour as the adults. The White-Lipped Pit Viper's diet are vertebrates, frogs, lizards, small rodents and small birds. After attack the viper doesn't release it's prey but keeps it hold until it dies. 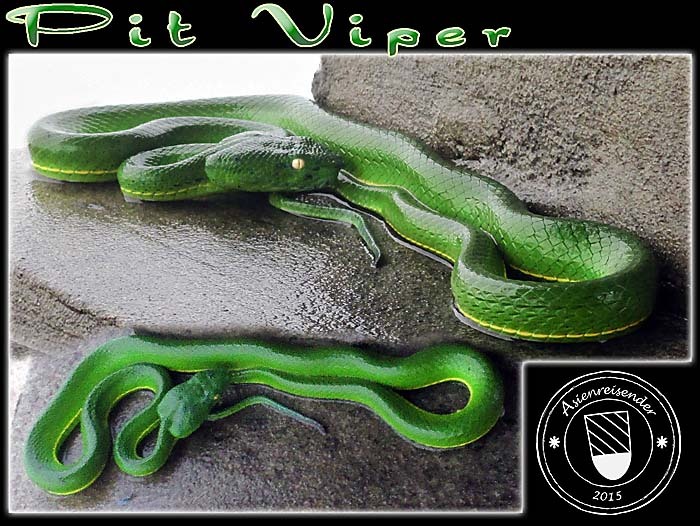 Alternative names are green tree pit viper, white-lipped tree viper, white-lipped green pit viper and white-lipped bamboo pit viper. The scientific names is trimeresurus albolabris. It's conservation status is classified as 'least concern'. There is a number of other vipers living in Southeast Asia. It's difficult for an amateur to exactly identify the certain kind.